A beautiful intact iron Battleaxe, dating to the Scandinavian Viking Period 8th.-9th. century AD. Viking axe of the the typical battle type for the period, 19 cm. long. Condition: Superb for type nice metal and silverish patina. Very nice, these are nearly always of bad metal and with chips. Superb Early Medieval German Stoneware beer Mug, 12th.-13th. cent! A scarce early medieval Beer Mug in this completely intact condition, Mug with grooves, brown clay. Rhineland, 12th.-13th. century AD. Ex. German, Nordrhein-Westfalen collection, aquired prior to 1986. A European bronze 'Morgenstern' Macehead, dating to the Migration period-Early Medieval period, 7th.-10th. century AD. Likely of central European manifacture; A heavy compact knobbed macehead in solid bronze with a 'eye' or loop at the top, for attaching it to a chain, connected to a pole or shaft. A very difficult weapon to wield, so rarely seen in collection. Size: 53 mm. high and 176 grams heavy. A large and choice Medieval Battleaxe, Knightly period, central-north European, likely Germany, ca. 11th.-12th. century AD. A fine large and impressive battleaxe with a great curving blade and reenforced socket. Makers mark near the socket at one side. The piece is cleaned and retains a fine iron colour with some patina remaining. Typical traces of corrosion but in an very nice state of preservation for the early type. Unusual and very rare Persian iron shield, 15th.-16th. century ! A high unusual and important large round iron Shield, Persian medieval period, ca. 15th-16th. century AD. Dahl shields from the Mughal period are pretty commomly seen on the market, but never this early a shield! An adorable broad silver ring with engraved cross, Byzantine, / Medieval period, 12th.-14th. century AD. The ring of fine high grade silver and with engravings on the shoulds and on the bezel, which could have been used as a seal ring. Size: 21 mm. or US size ca. 11 1/4. 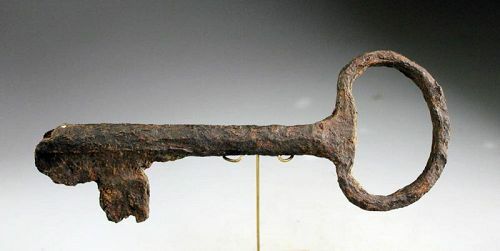 A rare and massive European Gate key, Late Medieval, ca. 14th.-15th. century. A very heavy key with kidney-shaped bow and a very thick stem and bit. Remnants of copper plating on the surface. Size: 21,3 cm. long and 8,3 cm. wide over the bow! Weight: ca. 300-350 grams. Condition: Basically intact with very heavy patina and corrosion and loss of metal to the bit. A beautiful Latten bronze spoon w Pine finial, England, 16th. cent. The spoon very elegant with an oval bowl and the pine finial. Interestingly a clear makers mark of three spoons or keys in the upper side of the bowl. Made in Latten - an alloy of bronze. 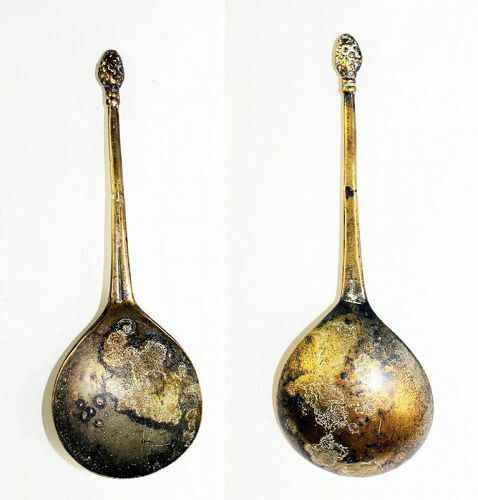 Condition: Choice, remnants of old silvering on the bowl and mark from contemporary repiar during use on the handle. Condition: Intact but rough, conserved earthfind with find patina, stable metal. Provenance: Birgit og Bent Wolstrup Collection. Sharp 16th. cent.Spanish bronze mortar - a gem! HEAVY SPANISH BRONZE MORTAR WITH HIGH RELIEF DESIGN, DATING TO THE LATER 16TH. CENTURY. Beautifully hand cast with a deeply moulded design of classical portraits enface in relief around the body intersected by ribs. The mortar is ca. 11,5 cm. wide and weighing app. 1,5 kilograms. RRR! Viking silver guilded filigree pendant 1000 AD! An extremely rare and attractive silver filigree boat-shaped pendant, Vikings of Gotland, c. 10th.-11th. century AD. All genuine Viking silver items are rare, so is this elaborate silver pendant, once around the neck of a Viking warrior or a warriors wife. The pendant is larger measuring c. 26 mm. in length. Rare medieval / Viking denaro, denar pfennig, 900 AD!! A rare medieval / Viking period silver coin, dating to Vendian or Viking kingdoms of Northern Europe, c. 900-1000 AD. Crude imitation of a Carolingian denar, slightly cup-shaped of fine silver. The coin shows a cross with 4 pellets / a church or another building. Condition: Good VF or better for type, very nice flan and wondeful old collection tone. A rare coin and unresearched, could be very good!